Geez... These days are just swimming by me. I thought today was Thursday!! If that were really the case I would be late for everything this week!! I'm back this week to share a card I made for this weeks challenge over at Cardz 4 Guyz. I was in a bit of panic mode when I saw this weeks theme. I don't have anything jungle!! I thought I had another Lawn Fawn stamps, but I didn't have it and it was too late to order it, so I winged it. Then seeing this weeks line up, it also included "wildlife"!!! Phew!! SAFE!! 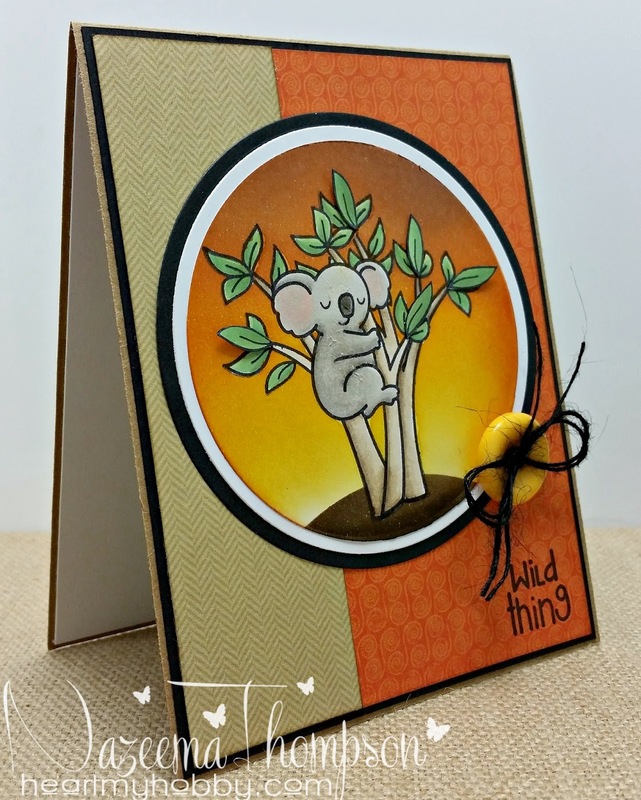 So for my card today, I used the Koala from Lawn Fawn: Critters Down Under. I masked and added two more trees to the scene. I created the background with distress inks and colored the image using my Copic markers. I tried giving the Koala little bit of texture, but I didn't want to over do it...but you can see a little from the picture. What a fab design, Nazeema - such a cute little sleepy koala. What a cute card! Love the dimension! Thanks for joining us at www.7kidscollegefund.com! I really love your card! That tangerine sunset is gorgeous! Unfortunately, in order to be eligible to win, you have to use our badge in your post. I hope you'll play again! Thanks for playing with us at Lawnscaping! Your card is absolutely darling! I love how you colored the image scene and the sentiment is just perfect. love the pop up leaves and the little koala!